Lot Sixty One Coffee Roasters is in west Amsterdam, just outside the main girdle of canals and not far from Monks Coffee Roasters. On a corner, where Kinkerstraat crosses over the Bilderdijkgracht canal, it occupies a small, cube-shaped street-level space, with lovely high ceilings and windows on two sides, one facing the canal, the other facing Kinkerstraat. As if it couldn’t make up its mind which street it’s on, the door is right on the corner, at 45⁰ to both Kinkerstraat and Bilderdijkgracht. For convenience sake, we’ll say that the front of Lot Sixty One faces east, overlooking Bilderdijkgracht. On the warm, summer’s morning I was there, sitting outside seemed to be the order of the day, with a four-person bench running along under the front window, partly shaded by a large awning. More benches, perhaps seating ten, run down the left-hand side, along Kinkerstraat. This is perhaps just as well, since there’s not a lot of seating inside. The counter, with its sleek Kees van der Westen Spirit espresso machine, takes up most of the right-hand side, while to the left of the door, a window-bar runs alongside Kinkerstraat, with six close-spaced stools. However, there’s more. A short, two-person bar runs along the left-hand side at the back, which is open, overlooking a basement-like space to the rear, accessed by a steep flight of seven, broad, short, wooden steps. These run down from the end of the counter, leading to a square, tiled room (walls and floor) that used to serve as both roastery and over-spill seating area. It’s maybe twice the size of the upstairs, extending a little to the right. It’s quite bright down here, with plenty of borrowed light from the front/upstairs, plus there are three small, square windows high up on the left-hand wall at street level. Unless it’s since been moved, a large Probat roaster is against the back wall, opposite the bottom of the stairs, cooling pan to the fore, while off to the right is a small counter used for training. Seating is provided by two broad wooden bars, one along either wall. The left-hand bar is slightly cramped, tucked down the side of the roaster, while the right-hand one is slightly longer, sitting maybe six, although the near end is right next to the water tap. There are also a couple of metal barrels down here, doubling as coffee tables, one in front of the training counter, with three fold-up chairs, and one to the right of the stairs, with a pair of low stools. If you have a bad back and can’t sit down, the bars are fantastic, by the way, since they’re just the right height to stand at. I started my day, and my exploration of Amsterdam’s speciality coffee scene, with a flat white made with the house-blend. I was tempted by the single-origin espresso, but barista said no, if I was going with milk, I should stick to the house-blend. I like a barista who isn’t afraid to say no to a customer. I was rewarded with a lovely, smooth coffee, nothing too challenging, which was the ideal start to my day. I paired this with a cinnamon roll, a classic of the type, slightly warm, slightly sticky, not too sweet, and bursting with cinnamon flavour. Perfect! For once I got somewhere before my friend Bex of Double Skinny Macchiato fame. You can see what she made of Lot Sixty One when she visited in December (when the roaster was still there). 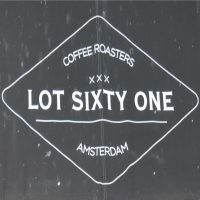 This entry was posted in Amsterdam, Basements, Cafe/Roaster, Cake, Coffee Shops, Laptop Friendly, Retailers and tagged Amsterdam2018, include, Lot Sixty One by Brian Williams. Bookmark the permalink.